For as long as I can remember, there has been one app that has constantly held the top paid app spot in Apple’s App Store: Angry Birds. Sure, other apps surge to the top briefly. But Angry Birds always comes flying right back. But a new app appears to be bucking that trend. Today is day 3 of The Heist‘s reign, and sales are quickening. As The Loop noted after a partial day 1, The Heist saw download numbers just over 25,000. 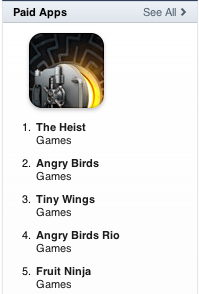 This was already enough to overtake Angry Birds. But what’s really remarkable are the day two numbers. There were 89,798 downloads of The Heist on day two. Again, that’s for a paid app ($0.99). There are 86,400 seconds in a day so… yeah, the app is selling at a pace better than one a second. Crazy. In total, that puts downloads now well north of 100,000, and revenues are nearing $100,000 already. In fact, they’re likely well past that number as I write this seeing as the app is also still the top-grossing app in the App Store. So what is fueling the surge? Well first of all, they had a good launch strategy. The team behind The Heist is the same team behind MacHeist, the popular OS X software bundle. They began hinting about The Heist game earlier this year, and actually hid clues in the initial version of Twitter for Mac (which they had a deal with). That proved to be enough to push it to number one, past Angry Birds, Tiny Wings, and other insanely popular apps. And getting to number one has its own perks. Because everyone sees you’re number one, they get curious and want to download your app as well, which led to the day two surge. Well that and the fact that the puzzle game is getting excellent reviews across the board. The tap tap tap team behind the app is also behind the truly great Camera+ app, which happens to be the number seven paid app in the store. In other words, these guys know how to make good apps — and money. You can find The Heist here in the App Store.